I attempted to read the rest of Gerace’s blog post but Verizon has erased years of its posts there and the Wayback Machine does not have a cache from that date. And no wonder, for Google anticipated precisely this situation when it entered the spectrum auction Verizon won and insisted then on open access as an FCC condition of the sale: Google ended up marketing an unlocked device made to run on Verizon’s LTE network and now Verizon refuses to honor its promise to abide by the rules of its auction to do so. On Twitter and Google+, many have asked why I bother, why I don’t just install the T-Mobile SIM and month’s free access that came with the Nexus 7 LTE. A few reasons: First, I am stuck with a shared-data plan on Verizon thanks to my locked (how could you, Google?!) Chromebook Pixel with LTE and my family’s Verizon iPads. Second, adding the Nexus 7 to my shared-data plan will cost me only $10 more a month, less than I’ll play if I support it solo on another carrier’s network. Third, this is a matter of principle. I will bring my Dell Hell experience to bear and fight for what is right. Some also caution that on the Verizon network, my Nexus 7 will connect only if LTE is available; it will not be able to fail down to slower speeds as it could on other networks. True; that is how my Chromebook Pixel works and I am willing to live with the limitation for the price. It has also been pointed out to me across social media that one can take a Verizon SIM from another LTE device, put it in the Nexus 7, and it will work. Only problems are, I don’t have such a SIM and if I did I’d need to use it in that other device. But this does prove — as others have done it — that the Nexus 7 *does* work on Verizon’s network. So this is not a matter of anything Verizon cannot do. This is a matter of what Verizon will not do. And that is what makes this a violation of FCC regulations and Verizon’s assurances. I have frequently asked Verizon for its help on Twitter and Google+ and in its store and via phone to Verizon Wireless via a representative in that store; you see the net of that above: a smart-assed refusal to take my money. I tried many avenues before writing this post. I have twice asked Verizon Wireless’ director of PR for devices, Albert Aydin (@VZWalbert) for a company statement on why it refuses to connect the Nexus 7 and I have heard nothing. I do so as a journalist and also as a member of the public (I take the title “public relations” literally). I will email this post to him once more asking for the company’s statement. I will also ask Google PR for its stand regarding Verizon’s violation of its assurances to the FCC and Google. Back in 2008, Verizon said: “As we work to put the spectrum we won to good use, if Google or anybody else has evidence that we aren’t playing by the rules, there are legitimate and expedited ways to address that.” Yes, like blogs, Twitter, Google+, Facebook, This Week in Google, Reddit, and angry customers everywhere. To which I replied: “Cannot” is a lie. “Will not” is truthful — and the violation of the FCC regulations. : LATER: Here is the *proof* that Verizon’s network *can* connect to the Nexus 7 but that Verizon *refuses* to do so, *violating* the FCC regulations. I took the SIM out of my Chromebook Pixel, put it in the Nexus 7 LTE, and it worked — note the “VERIZON WIRELESS” at the bottom of the screen and the bars at the top. Hmmm. This device was announced two months ago. They are just getting around to thinking about this now? Or they are succumbing to pressure and the requirements of the FCC’s regulations? I report, you decide. Funny thing is, Verizon apparently responded to CNET and Android Central but not to me. All they tell me is that they won’t/can’t do it. I’m asking questions elsewhere to interpret this. The device already works on Verizon’s network. The issue is that Verizon won’t give me a sim and add it to my account. Again we come to the “can” vs. “will” conundrum. More later. Google announced its Nexus 7 LTE tablet earlier this year and promoted the fact that the device would operate on the LTE services of T-Mobile, AT&T, and Verizon Wireless. On that promise, I bought a Nexus 7 LTE from Google — waiting weeks for it to be offered in addition to wifi-only devices. I received it last Friday. On Saturday, September 15, I went to the Verizon Wireless store on Route 206 in Bridgewater, NJ, and attempted to add the device to my shared data plan. I was told that it could not be added because Verizon had not yet added the IMEI numbers to its system. The clerk called Verizon himself and could not solve the problem at the time. I’d had a similar problem when I attempted to activate my Google Chromebook Pixel with LTE service sometime before and that was solved eventually by adding the SKU to the company’s system. So I thought this would be solved with help and I reached out to Verizon support on Twitter and Google+. There Verizon is refusing to connect my tablet though it has been approved by the FCC and is compliant with standards such that it is also being offered and being activated on AT&T’s and T-Mobile’s LTE networks. Further, Verizon is instead attempting to require that I buy a tablet from them. This is a clear violation of the letter and intent of the openness requirement on Block C.
I later tested Verizon’s claim that the device could not be connected. I took the SIM from my Chromebook Pixel, placed it in the Nexus 7 LTE table, and it connected to the Verizon network just fine. So the issue is not that the device cannot be connected but that Verizon will not connect it. Thus it is clear that Verizon is violating the terms of the Block C spectrum auction and of its consent decree with the Enforcement Bureau of the Commission. But Verizon Wireless is not doing so. I contacted public relations executives at Verizon Wireless via Twitter and email and on the third attempt received communication directing me to its certification process. Yet in a November 27, 2007 press release the company said that “Any device that meets the minimum technical standard will be activated on the network.” Clearly, the device meets the standards for it has been approved by the FCC; it works on T-Mobile’s and AT&T’s networks; and it demonstrated that it works on Verizon’s network. This is a matter of Verizon subverting the Commission’s rules related to the requirement of openness on Block C. It is also a matter of consumer fraud. I ask that you forward this complaint to the appropriate authorities at the Commission and I ask that you inform me of the progress of your investigation. * The Associated Press gets into the CIA’s social-media analysis operation, which only makes me think that we in journalism should have just such operations ourselves. * Adding my experience with Reid Hoffman to the deserved attention he got today in The New York Times: Reid as an open human API. * Dell Hell charted against Dell’s share price. It wasn’t my fault. I swear. Dell has started another blog with execs and employees talking about personal technology. It’s called Your Blog but I’m not sure why; it seems to be their blog or, from their perspective, our blog even if they invite people to send them messages atop the front page. And that’s fine; I’m merely puzzled about the name. What’s good about this is that it is Dell people talking as people more than as a company, even if it is around technology, not their cats. This follows Chris Locke’s precept in Gonzo Marketing that companies should want their employees to show their public that they share the same interests. 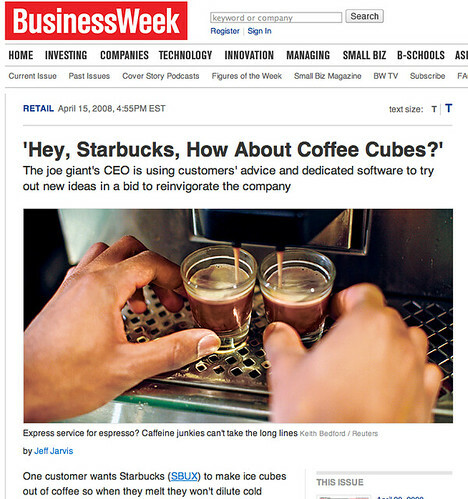 Just as I was researching a column for the Guardian on Starbucks’ MyStarbucksIdea and Dell’s IdeaStorm — both of which use Salesforce.com’s Ideas platform — I got an email from Business Week asking me to write about Starbucks. So here’s a twofer: my Guardian column about this new platform for customers to share ideas (and my wish that it would come to government) and the Business Week story about Starbucks. Here are some added quotes from my interviews. * On whether this is really new. “I believe that these days, the rapid communication that is enabled by wikis, blogs, Twitter, YouTube and you name it ensures that no matter what kind of company you are, your customers are having a conversation about your products and practices. The question that every company has to ask is: ‘Do I want to be part of this conversation? Do I want to learn from it? Am I willing to innovate on the basis of it?’ If you harness the power of this community, you will benefit. If you turn your back on it, you get further and further out of touch while competitors flourish. So yes, I think this is a new kind of communication for a new age of customer engagement. The dead-end suggestion box and the auto reply are symbols of corporate indifference and are no longer tolerated. Customers expect a higher level of responsiveness now, and they will go where they find it. We learned this when we were pioneering Software as a Service. We had to stay connected with our customers or they would not continue their subscriptions. We needed to hear their ideas, or we would miss out on their creativity. And most important, they needed to talk to each other. Dell and Starbucks are pioneers in understanding this. * What’s next? RSS and the ability to track an idea’s progress. Following Dell’s Ideastorm, Starbucks has no opened a forum — also powered by Salesforce.com — where customers can make suggestions then discuss and vote on them. Starbucks, of all companies, with its loyal and opinionated customers, should have been doing this years ago. Every company should be doing it now. If auto companies had this five years ago, we’d all have told them to force their radio manufacturers to include a damned 39-cent plug so we could hook up our iPods. If airlines had it today, we’d tell them how to get out of their customer-service mess. Why does listening to your customers sound like a web 2.0 idea? It should be a business 1.0 necessity. Already, there are clear themes coming out in the Starbucks discussion. Many customers are suggesting — and many more are agreeing — that our frequent-sipper cards should have our regular orders embedded in them so we could swipe the card at the door, make the order, pay for it, and avoid that damned line (making that damned line shorter for everyone else). Others are also suggesting they want to do the same with their iPhones. This genius comes not from MBAs or executives but from customers. If you’ll just listen. More customers want express lines for simple drip orders or sandwich purchases. More want employees manning the cash registers instead of running around taking orders in advance and then messing them up (well, that’s my variation on the theme). Note the underlying chorus: those damned lines. One customer gives decorating advice to avoid the stores wearing down and looking so ratty, as so many do. One suggests what I’ve long wanted: a drain at the cream station to drain that excess coffee. Yes, it’d be expensive to retrofit that, but shouldn’t it be part of the spec for new stores now? Get rid of the tip jars, says one customer — but others in the comments disagreee. That’s what is great about these Salesforce storms: out of the conversation will come some measurement of consensus. There are calls for whole wheat. Lots want free wi-fi (which means Starbucks hasn’t done a good job of telling people that it’s coming with its switch from T-mobile to AT&T). This customer wants softer music. It is, after all, our office. And, of course, stop the Vente madness. What an incredible wealth of information, ideas — and caring — from customers. All you have to do is listen. I believe that Salesforce’s Storms are an important new infrastructure for customer conversation — a forum mixed with Digg mixed with a suggestion box mixed with a company blog. I don’t understand why companies aren’t falling over themselves to at least offer their customers this opportunity. Too often, it’s because they’re scared of what their own customers will say. Except now, they’re saying it on the web anyway. That’s the lesson of Dell and now of Starbucks.